Inducted 2009. 25-4 Team Reaches Sweet 16 in Last Season of Single-Class Basketball. The beginning of the 1970 basketball season was one of uncertainty. The team lost several good players, including an all-stater, from the team that went 26-2 the year before. It would be the last season of single-class basketball in the state. The school’s future was tenuous, and even the name of the school had changed from Christian Brothers to Catholic Boys. The Raiders started the season by winning the championship of the Hannibal Tournament, but a month later, the team had a 7-3 record and was on a two-game losing streak. Eighteen consecutive victories later, it was a season to remember. The Raiders averaged 78 points per game during their record run that included an overtime victory against Chicago Dunbar, a 28-point victory over Ottumwa, Iowa just one month after a 27-point loss to the same team, and a 76-70 victory over Quincy High School that was the second in a row over the crosstown rivals. CB was undefeated at home for the second season in a row. The Raiders romped past Hamilton in the sectional semifinals and edged Jacksonville by one point in the sectional title game to reach the Sweet 16 for the first time since 1957. Hopes of reaching the state tournament were dashed in Macomb at the super-sectional in a 60-59 loss to Kewanee. The final record was 25-4. Team members were Rick O’Donnell, Roger Stuckman, Ed Willer, Greg Gagnon, Mark Schuering, Bob Henry, Don Schutte, Tom Sparrow, Jim Fitch, D.A. Weibring, Steve Wilson, Dan Pieper, Dennis Cassidy, Jim Bockenfeld and Steve Siebers. Mike Otolski and Chuck Budde were the assistant coaches. Bob Bender was the head coach. 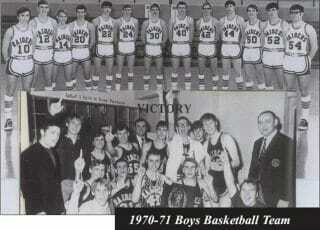 Thanks to the QND Hall of Fame Committee for choosing the 1970-71 basketball team to be honored. Thanks also to my assistant coaches, Chuck Budde and Mike Otolski, for all their help and support. That season has many great memories that were the result of hard work, dedication and team play. For a school as small as ours to be ranked as high as eighth in the AP poll and earned the record that it did was a credit to the players, managers, parents and faculty. Congratulations to a very special team.